Tech Trash is an essential component in Timed Explosive Charges and weapon attachments. Tech Trash can be gained via military crates or the recycler. Its completely unnecessary in the beginning, so if you have the oppertunity to recycle it and you will get you loads of scrap. 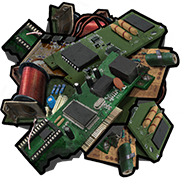 During late game, you may find yourself in need of tech trash, but in surplus of scrap. A possible way of obtaining tech trash is purchasing an auto turret at the Outpost, then recycling it and recycling the targeting computer or cctv camera.